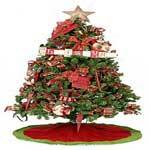 The Christmas tree is probably the most important decorative item you will have in your house at Christmas time. Traditionally the tree is filled with glimmering lights and sparkling ornaments which makes the Christmas tree very special indeed. 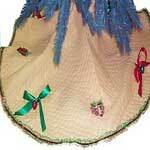 You can make a your own Christmas tree skirt that will match the trees lighting and ornaments. 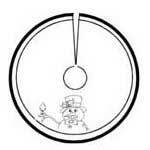 Below you will find several patterns to choose from. Some projects use recycled materials such as a wedding dress. Make a nutcracker tree skirt that glitters or a quilted gingerbread man tree skirt. Whatever pattern you decide to make, you are sure to have fun making it and love the results. These directions sew a Christmas tree skirt that is approximately 72 inches wide when complete. 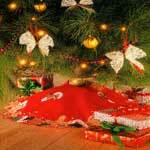 Making your own tree skirt is simple, and can be done as a project for the whole family. Make a skirt for your holiday tree, here are two styles to pick from. 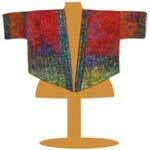 This pattern calls for quilted fabric and is so easy to make. This skirt features Santa and measures 40 inches x 40 inches, complete with instructions and materials needed. 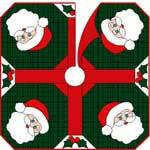 Here are so many different ideas on making your own Christmas tree skirt for the holidays. 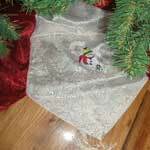 A glittering tree skirt that is certain to become a Christmas heirloom. 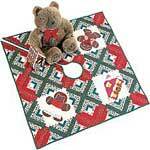 A really festive quilted tree skirt with the gingerbread man & gingerbread house. It's always rewarding to take a simple or plain idea and mold it into something personal and unique. 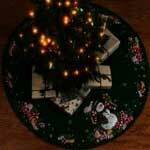 Finish off your tree decorating with a red and white reversible tree skirt. Here is a craft idea that you can make as sophisticated or as straight-forward as you like.